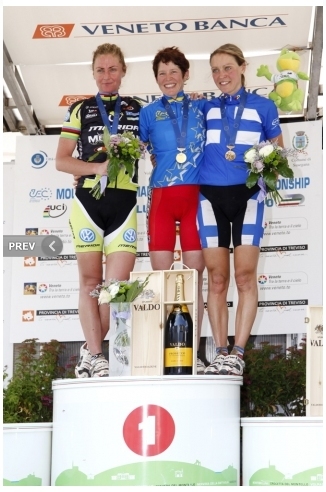 Bronze medal at the European Championship in XCM. I am happy with the result, I did my best and gave all I had. I arrived with zero energy. The race day in Montebelluna was to be very hot. The course was also long and I had the feeling every rider had a lot of respect for it. Our race distance was 112km, 15km longer as initially planned. The reason for this was the heavy rain the week before. The organizers failed to build a pridge over Piave river and we had to ride up to the closest permanent bridge. This did not upset me, because I knew the longer the race is, the stronger I will be. The first climb in the race and Blaza made the speed. I was happy and hoped it would blow up the group a bit before we would hit the first single track. This did not really happen, but after the first downhill we were 6 girls in the front. After the second single track section there were only 4 of us, me, Gunn Rita Dahle, Esther Suess and Blaza Klemencic. We continued together and I felt very comfortable. I had to stop once as piece of tree went into my back wheel. Luckily nothing broke and I could catch up to the group pretty quickly again. The first 85km was only waiting. I must say I felt super strong. When the last part of the race started I attacked in a steep climb, got a gap and thought this was it. Now I just continue hard. All the up and down killed me though, or let me say it killed my right leg. It seems that I have a problem with the iliac artery. A problem I will resolve after the season. For now I will ride the best I can having this deficit. So I am very happy about the medal I won yesterday. Now I am relaxing for a few days on Plose mountain close to Brixen in Italy. The weather is great, I have a load of books and enjoying cappuccino and gelato several times a day. On Friday I will start in Zillertal Challenge in Austria. 3 days of racing and about 10.000 meters of climbing. A tough weekend in front of me.